Explanation: Why does the Andromeda Galaxy have a giant ring? Viewed in ultraviolet light, the closet major galaxy to our Milky Way Galaxy looks more like a ring galaxy than a spiral. 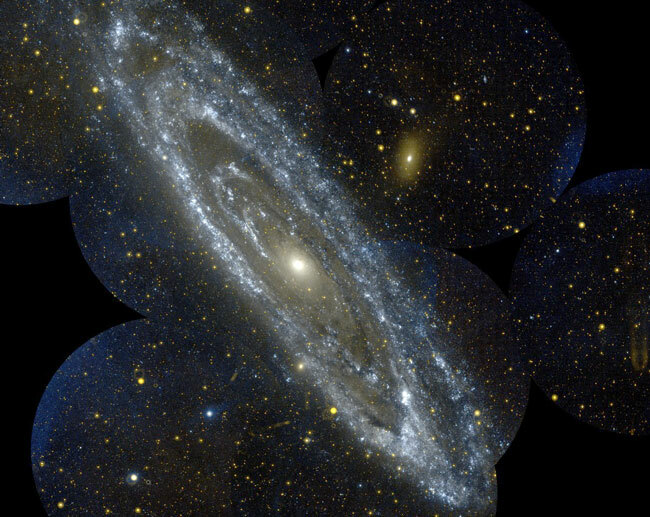 The ring is highlighted beautifully in this newly released image mosaic of Andromeda (M31) taken by the GALaxy Evolution Explorer (GALEX), a satellite launched into Earth orbit in April. In the above image, ultraviolet colors have been digitally shifted to the visual. Young blue stars dominate the image, indicating the star forming ring as well as other star forming regions even further from the galactic center. The origin of the huge 150,000-light year ring is unknown but likely related to gravitational interactions with small satellite galaxies that orbit near the galactic giant. M31 lies about three million light-years distant and is bright enough to be seen without binoculars toward the constellation of Andromeda. News: Today is the December Solstice.